This is a fabulous brooch! It depicts a man & a woman sitting side by side with raised legs. 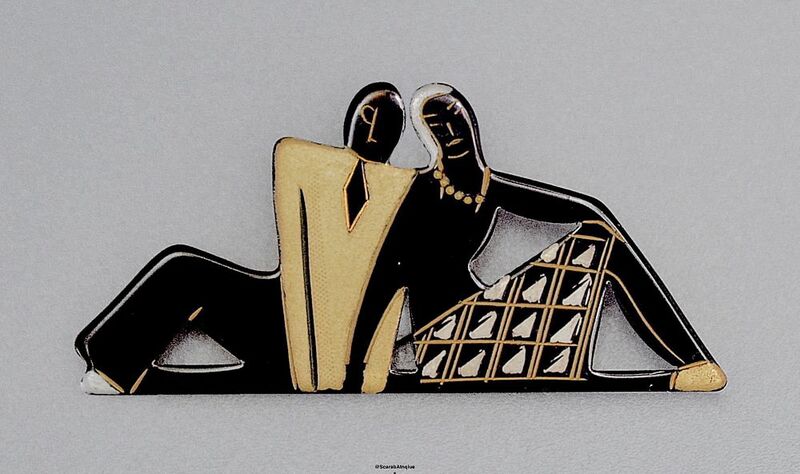 The brooch was designed by Auguste Bonaz and is made of black phenolic with applied gold and silver "enamelling" - the man's jacket is gold as is his shoe whilst the woman has silver hair a gold necklace and a gold and silver geometric patterned skirt and a gold shoe. The minimal features of both the man and woman (the man has a monocle) have been picked out in gold. There is a slide fastener.